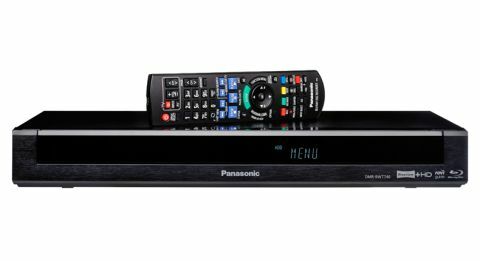 Panasonic DMR-BWT740 review | What Hi-Fi? For some reason, Panasonic seems to be the only company bothering with Blu-ray recorders these days. It would be easy to get complacent in the face of absent competition, but the company keeps developing impressive new models. And so we have the Panasonic DMR-BWT740, the company’s latest Blu-ray recorder. Well, calling it just a Blu-ray recorder is a little unfair. It’s a multimedia beast, and does a lot more than the BD-R label implies. It’s a PVR with a 1TB hard disk on which you can record up to 684 hours of content. There are two tuners for Freeview HD, so you can watch one thing while recording another, or record two programmes at the same time. On top of this, you get web-based content too. The box also handles 4K upscaling, multi-room streaming to portable devices in the home and Miracast for mobile streaming. Then there’s DLNA certification, which means you can stream content from networked devices too. All that, and it plays and records to DVDs and Blu-rays. With all those features, you might expect a slab the size of an old VCR. But it looks like a regular Blu-ray player – it’s a sturdy metal box with a drop-down front panel. Open this and you’ll find the disc tray mechanism, a large display and basic controls, along with a USB port and SD card slot for adding your own content. Around the back is a generous array of connections. There are RF in and out sockets for TV pass-through, while video output is via HDMI. Audio output is more varied, coming in optical, coaxial and analogue stereo flavours. A scart input lets you make analogue recordings from older devices, and another USB port means you can attach external hard drives. There’s an ethernet socket and built-in wi-fi to complete the specification. The set-up process is easy. It’s just a matter of plugging in and following the on-screen prompts. You’ll have a full list of channels - and internet connectivity - in no time. Navigating with the remote is a bit trickier. If in doubt, use the Function Menu to take you to the equivalent of a TV’s hub screen where you choose between live TV and recordings, or go into settings. Making recordings of live TV is easy. See something you like and hit record. Alternatively, there’s a programme guide like you’d find on any TV, where you can set timers for upcoming shows. There’s even an option to do that from your smartphone. Recording to disc requires copying from the hard disk. Unfortunately you can’t do it straight to DVD or Blu-ray. For smart content, you get Panasonic’s slightly dated Viera Connect. There’s not much we’d download from the Market really: just Netflix, BBC iPlayer and YouTube. Netflix fans, though, will like the dedicated button for it on the remote. For the most part, the interface is zippy and responsive. The machine will have a good think about the more intensive tasks (loading up the smart portal, for instance), but general flicking about is fine. As for video quality, we have no complaints. Blu-rays look sharp, detailed and clean. Colours are punchy yet convincing, and skin-tones are natural. And it’s the same when watching Freeview HD. Standard-def content inevitably looks a little softer and grainier, but overall we’re very pleased. We’re also equally pleased with the quality of video recorded from Freeview HD. Both hard disk and Blu-ray playback offer the same quality as live TV. Sound is typical Panasonic: clear, smooth and with generous weight. For some, the Panasonic DMR-BWT740 will be a bit much. But if you find yourself looking at a standard Blu-ray player and sighing at its simplicity, then this might just be the answer. Its array of functions is mighty impressive, and we think it offers great value for the money.